“Did it sound a bit like Shakespeare?” I asked. “Was it important to your granny? I asked. “Yes. She read it all the time. Kept it next to her bed in the home,” she answered. I put down my coffee and looked at her. “It’s a curious book.” I closed my Bible so we could read the cover. “Do you see it’s full name?” I asked. “It’s called the ‘Holy’ Bible because the word ‘Holy” means ‘special.’ It’s a unique book, unlike any other.” She picked up her coffee and came over to my booth and we began to talk. “Let me see if I can give you some reasons to pick your Bible up again,” I said. “There are a lot of really old books though aren’t there?” she asked. “If men had written the Bible from their own unaided wisdom, the same silly ideas we find in other ancient books which treat scientific matters would be found in it. How shall we explain their absence in Scripture?” — Rubel Shelly. “William Shakespeare wrote 400 years ago. How can you be sure the Romeo and Juliet we are reading is the same as the one he wrote?” I asked. “Can’t we just look at his first manuscript?” she asked. “We don’t have it,” I answered. Of Shakespeare’s plays, for example, no manuscript in his autograph is known, and much the same is true of the productions of the other playwrights who worked in the great period of drama from 1580 to 1642. …. The facts can be summarized in this way: no play by a professional playwright which was successful on the stage and which was printed before 1642 is known to have come down to our time or near it. “Well that makes sense I suppose.” The waitress refilled our cups. “With the risk of boring you,” I apologized, “let me share some statistics with you. You’ve heard of Julius Caesar?” I asked. Of the 142 books of the Roman History of Livy (59 BC-AD 17) only thirty-five survive; these are known to us from not more than twenty MSS of any consequence, only one of which, and that containing fragments of Books iii-vi, is as old as the fourth century. Of the fourteen books of the Histories of Tacitus (c. AD 100) only four and a half survive; of the sixteen books of his Annals, ten survive in full and two in part. The text of these extant portions of has two great historical works depends entirely on two MSS, one of the ninth century and one of the eleventh. The extant MSS of his minor works (Dialogue dc Oratoribus, Agricola, Germania) all descend from a codex of the tenth century The History of Thucydides (c. 460-400 BC) is known to us from eight MSS, the earliest belonging to c. AD 900, and a few papyrus scraps, belonging to about the beginning of the Christian era. The same is true of the History of Herodotus (c. 488-428 BC). Yet no classical scholar would listen to an argument that the authenticity of Herodotus or Thucydides is in doubt because the earliest MSS of their works which are of any use to us are over 1,300 years later than the originals. — F.F. Bruce, The New Testament Documents: Are They Reliable? “Okay, okay,” she said moving towards the outside edge of the booth. “This is beginning to sound like a sermon,” she protested. Use a Good Translation – the Bible was originally written in Hebrew and Greek. Keep Granny’s Bible with your precious keepsakes, but read the Bible in a modern translation. 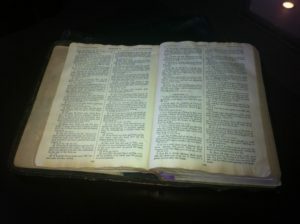 The Bible has an amazing history – It’s a very old book that is just as popular today as it was thousands of years ago. No other book compares in terms of popularity and circulation. The entire Bible is available in 554 languages. The New Testament is available in 518, and parts of the Bible have been translated into another 2,932 languages and dialects. No other book has had as much influence on western thought and literature. If you want to understand culture, you need to be familiar with the Bible. But the most important reason of all is the claim that the Bible makes to be the Word of God. Think about it! If it truly comes from God and not just people thinking about God, then no other book is as important as the Bible. When you read the Bible, God is speaking to you! Politarch. In J. D. Barry, D. Bomar, D. R. Brown, R. Klippenstein, D. Mangum, C. Sinclair Wolcott, … W. Widder (Eds. ), The Lexham Bible Dictionary. Bellingham, WA: Lexham Press.